You make sure your child sees the doctor and the dentist on a regular basis, but what about the eye doctor? Eye health is also a vital part of your child’s well being. Here’s some information that will help you keep your child’s eyes healthy. Children should have their eyes tested periodically before the age of five. Your child’s pediatrician will usually perform this test as part of a regular check-up. If anything appears out of the ordinary, the pediatrician will then make a referral to an eye doctor. Ask your pediatrician about the eye tests he gives your child so that you can stay informed. After age five, the public school system usually takes over as the primary source of eye tests. Some pediatricians will continue to test eye health during scheduled check-ups. Know where your child is being tested, how often, and how to find out the results. You can also watch for eye problems at home. Does your child tend to squint or rub his eyes? Are your child’s eyes abnormally red, teary, or crossed? Does your child have difficulty following movement, seeing objects or reading? Does your child experience frequent headaches? All of these symptoms could indicate poor eye health and should be checked out by an eye doctor. Some eye conditions can even be reversed if caught and treated early! Learn more about common eye conditions. Blurry vision is often caused by farsightedness, nearsightedness, and astigmatism—conditions that occur when eyes do not bend light properly. Other common eye conditions include an eye misalignment (strabismus) and lazy eye (ambyplobia). Farsightedness, nearsightedness, and astigmatism can be treated with corrective lenses. Strabismus may require special lenses or surgery for proper treatment. Lazy eye, a general term that applies when one eye does not work as hard as the other, may develop on its own or if other eye conditions are left untreated. Lazy eye is usually treated by a patch or special corrective lenses that force the “lazy” eye to work harder. Protect your child from potential eye injuries. Each year in the United States about 40,000 people receive an eye injury while playing sports. Prevent eye injuries by making sure your child wears protective eyewear while playing sports like basketball, hockey, baseball, karate, and soccer. This is especially important if your child has poor vision in one eye. Making sure the good eye is protected is an important step in preserving your child’s sight. If your child does require glasses, keep these tips in mind. Let your child pick the right frames. Your child should have some control of what he will wear. But his choice can be guided. Plastic frames usually work best for toddlers. 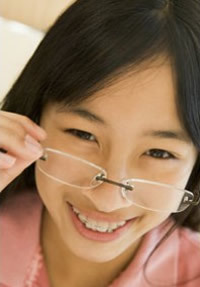 For older children who want to wear metal frames, look for spring hinges. These frames are more durable. Wear elastic straps when appropriate. Elastic straps that fasten around the head can be useful for toddlers or budding athletes who wear glasses. Get the right lenses. You may have a choice between regular plastic and polycarbonate lenses. Polycarbonate lenses are lighter, thinner, and stronger than regular plastic lenses. This combination makes them more comfortable and ideal for children who play sports. However, polycarbonate lenses scratch more easily than plastic lenses do. Depending on your child’s age and eye condition, contact lenses may also be a possibility. Contact lenses should only be used if your child can responsibly clean and care for them.